Since this is a big event for all us excited and hungry party goers, it will span for two weeks in a row, ‘Non Stop’. Week 1: The Amuse-Bouches and Appetizers week. For all those who have missed out on the invite, I am adding the invite at the end of the post on behalf of the gracious host Angie. For week 1 , I am planning to get two appetizers. The second one I will be plating up soon. I want to reach early, as I don’t want to miss out on anything. My first appetizer will be ‘Vietnamese rice paper spring rolls. Absolutely light, healthy and fresh. Because there are too many dishes to be tasted. Soak the vermicelli in a bowl of warm water and drain when the threads are translucent (or as per instructions on the packet). Add all the other ingredients except rice paper, in a large bowl. 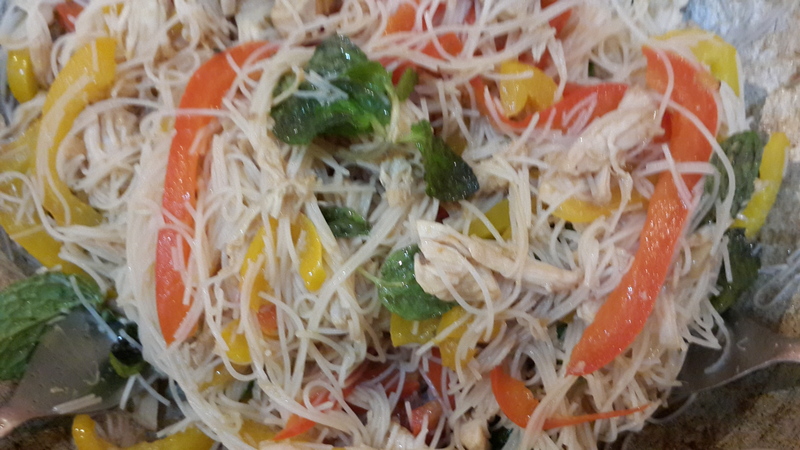 Add drained vermicelli and toss well. Now soak rice papers in a shallow bowl of water one at a time for 15 seconds( more than one can stick to each other). Remove gently and place on a clean tea towel. 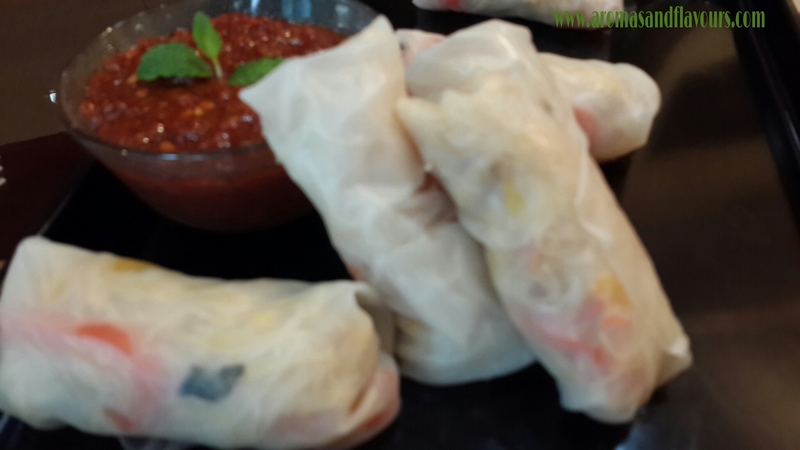 Arrange a heaped tablespoon of the chicken filling along the center of the rice paper and roll up firmly like a spring roll. 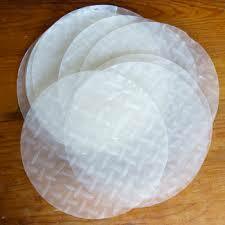 Repeat with remaining rice paper wrappers and filling. Serve with sweet chilli sauce and a sweeter smile. This will be an amazing contribution to the party! I’ve never used rice paper or made spring rolls, but I will. You gave me such great instructions, that the ideas are just bouncing all over in my little head! 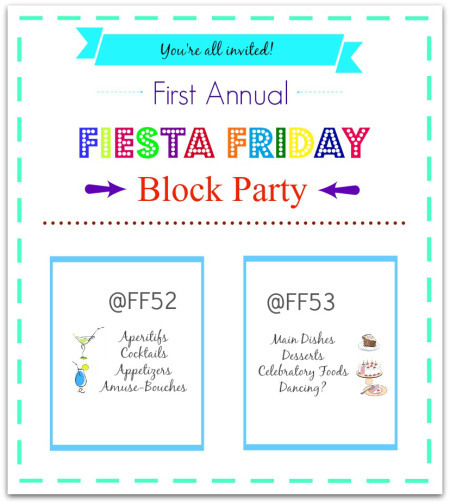 Excited for the party on Friday. I’ll be there getting sauced and full from all the munchies. I love how excited you are!! As a co-host for the party and on behalf of Angie, thanks so much for spreading the word! I think I know who the “party animal” will be this week, skd!! 😉 You’re getting the party started early AND with a delicious appetizer. 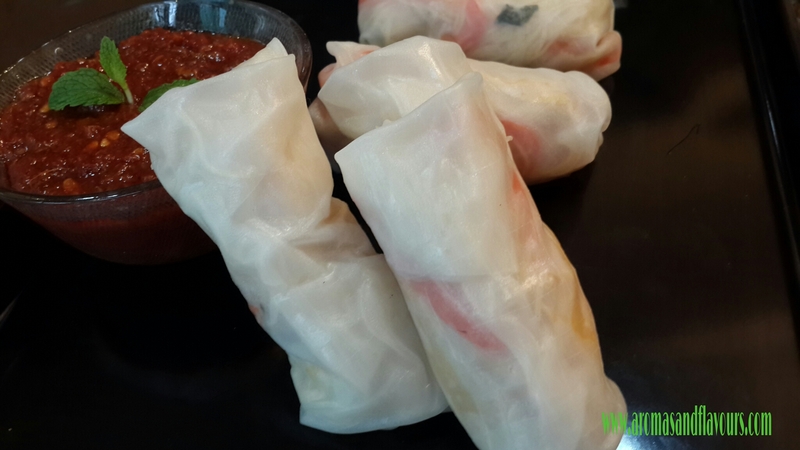 These rice paper rolls you prepared look fabulous and sound positively delicious! I love the filling ingredients! Thank you Nancy 🙂 Yeah I am all geared up for some wonderful feasting with friends ; ) These rolls are light on the appetite and very easy to make. Hehe… love your play on words! Thank you Loretta 🙂 Last week I was late. So donned my aprons early this time 🙂 haha. Hope to see you there too . Thank you Natasha 🙂 Please do try. It is so easy to assemble and tastes delish too. The rice papers look phenomenal. Then, I realized it is for real! Thanks dear 🙂 Even I discovered them recently. Thank you so much 😃👍 Why don’t you join us. yuummmmmmmmmm, looks so delicious, must try this once day! I´m so glad 🙂 you have a great blog! It should be honoured! Love it! Will try to create a veg version since I have the rice paper in the cupboard! A yummy post :). With so many yummy things to try, something light and fresh is just what we need skd – and these look amazing! Happy FF anniversary!! love these they are so simple and so yummy, had forgotten how much I liked to make them until I saw them again your website! yummy PS I am curious where does your pic come from looks like an excerpt of the cake but also a face which is the point I guess – or is it something else entirely? This recipe’s different (and sounds better) than mine. Love that it doesn’t need bean sprouts which are often hard to find here in France. Can’t wait to try it! Thanks dear Jan ☺ Please do try it. I am sure you will love it. 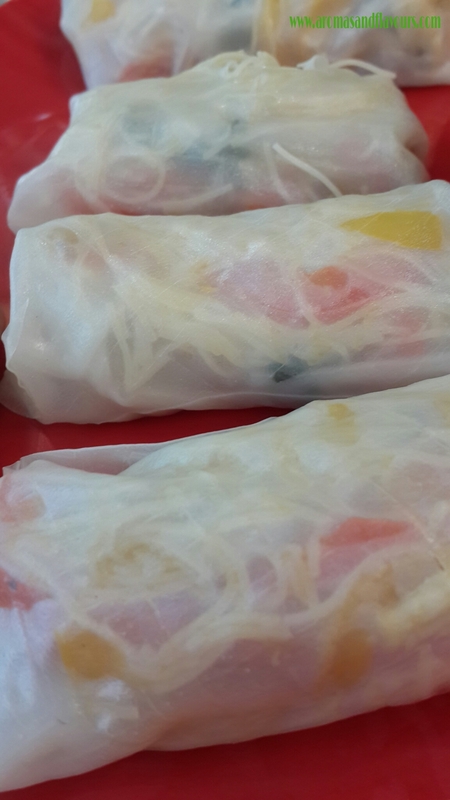 ..
i love these summer rolls and so healthy too! Is there a specific brand of rice paper sheets that you would recommend? Oh, I love rice paper rolls, hope their will be some left for me at FF52. Oh definitely dear ☺I am saving some for you right now. These summer rolls look gorgeous! Mouthwatering. Ps. I love it so much ive become redundant lol thanks for this post! Welcome Suchitra ☺It’s a pleasure to share with my friends. Please let me know how it turned out when you try it. Thank you so much ☺ It is light, healthy and doesn’t need to be fried like other spring rolls generally are. Yes that is a big plus!